This is a mish-mash of the original review I wrote back in January 2009 and my updated review following my visit in May 2013. 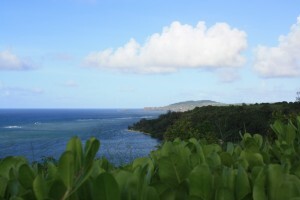 I was in desperate need of a vacation after the Christmas season in 2009, so we decided to head to Kauai. This time, we were celebrating the graduation of my stepdaughter from high school. This was my fourth trip to the Hawaiian Islands and my second time to Kauai. After both stays, I think if I ever return to Hawaii (which I will! ), I will always make Kauai a part of my itinerary. Back in 2009, United Airlines was offering ridiculously low airfare to Kauai from Phoenix, so for the first time ever, I flew United. We had a stop in LA, which wasn’t terrible, and the flight wasn’t bad, except for the row of young children who were sitting in front of me. It was a family of seven- two parents and five kids. For some reason, the parents both sat in the left row of three seats and left three of the kids to sit by themselves on the right. This proved to be quite a disaster, especially since one of them (or maybe more?) had a cold, and guess who acquired that cold halfway through their trip? So, sitting behind a few wild children not only ruined my flight, but it ended up almost ruining my trip. Thankfully, the flight home was uneventful. We had bumped up to Economy Plus, which was worth the extra $138, and I had taken lots of NyQuil for my terrible cold, so I was able to sleep for the entire trip home. Looking back to 2009, it is funny to read that it was my first ever flight on United. I’m now United MileagePlus Gold/Star Alliance Gold and have been for three years. So, to keep up with my status, I booked two first class tickets on USAirways (Star Alliance partner, but not for much longer) direct from Phoenix to Lihue. I outright purchased my ticket so I could accrue miles. So, for under $1600, I had three first class tickets. USAirways first class is nothing to write home about, but it made the 6 hour flight a bit more tolerable, especially on that red eye leg back to Phoenix. As I’m sure I have mentioned in previous reviews, I own timeshares through Starwood Vacation Ownership. 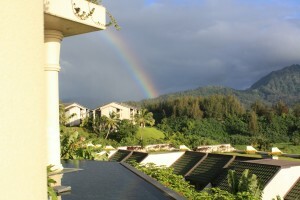 Both times I chose to exchange it for our stay at the Westin Princeville in Kauai. Back in 2009, the resort was less than a year old and is quite magnificent. Starwood tried to create a more authentic Hawaiian experience, rather than the opulent luxury that is offered two miles down the road at the St. Regis Princeville. My feeling is that the Westin did a great job combining the authentic Hawaiian experience with the luxury that Westin offers. In 2009, we had a one bedroom studio, which was quite roomy, although we missed not having a kitchen table. The décor was beautiful and the room was very well maintained. Since we were on the 3rd floor of Building 3, we also had a small view of the ocean (side note- the resort sits up on a cliff and does not have direct beach access. There is a shuttle that takes you to the Princeville to visit the beach.) In 2013, we upgraded to the one bedroom premium villa, which had a full kitchen, minus an oven, and a nice eating area. We were on the first floor of Building 3, but this time, had a direct ocean view from our patio. I hope I’m lucky enough to end up in this room again next time. The resort grounds were very lush both times, but even more so the second time, and it was meticulously maintained. There were four pools, two of which are smaller pools in between the condos. Since the resort only has timeshare units, there was one main restaurant for all three meals and a market to purchase food that can be cooked in the condos or on the many grills that were located throughout the property (side note- as with all resorts, the market was a little pricey, so we purchased all of our food at the Wal-Mart located in Lihue and the Safeway in Kapa’a.) We used the grills at almost every meal and got pizza one night from the market, which is surprisingly good! Since I was so sick in 2009, we didn’t eat out much. This time, we chose to explore a bit more. We went back to Bubba Burger in Hanalei for some greasy goodness, went to a luau (more on that below), and had a fancier meal at Makena Terrace at the St. Regis on our last evening in Kauai. Makena has some amazing views and the food was just outstanding! It was quite pricey, but worth the splurge. 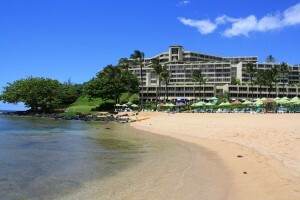 As I mentioned above, as part of staying at the Westin, you are able to visit the beach at the St. Regis. We chose to spend one day down there to have a change of scenery. We really loved just laying by the pool at the Westin with the awesome service from our go-to waitress, Melissa. However, the beach was also a good way to unwind. It seemed a bit more crowded than just laying by the pool, but the signature St. Regis service gives the experience a nice touch. The views from their beach of Hanalei Bay are just amazing. The swimming is decent, though there are very areas that are not covered by coral, so be careful walking around and wear reef shoes. Just from the little bit of time we spent at the St. Regis, it was obvious that the resort is geared toward service and luxury. It’s a gorgeous resort with an even more gorgeous view, but I think I may prefer the Westin just because it seems more Hawaiian and also allows you the flexibility to splurge where you see fit. Everything about the St. Regis is expensive. Due to my illness in 2009, we did not get to explore the island as much as I would have liked. The first two days we were there, before my cold took hold, we were able to get out and see some of the free sights that make Kauai so beautiful. On the first day of our first trip, we drove from Princeville to the Waimea Canyon. It was an all-day activity and the canyon is gorgeous. We also stopped along the way to take pictures from some of the scenic points that are marked along side of the road. We revisited the Canyon during our second trip so my stepdaughter could enjoy the views. She, however, get motion sick and the long car ride from Princeville was very difficult on her. So, we never made it back to that side of the island during the remainder of our stay. We did break up the long ride with a stop at Kauai Coffee. It was a quick tour and my family enjoyed some of the delicious coffee. On the second day of our first trip, we chose to hike the Kalalau Trail, which is just past Hanalei on the North Shore. The trail boasts stunning views of the Na Pali Coast and can be a 4 mile round trip hike to Hanakapiai Beach or 11 miles one way to Kalalau Beach. While I have to admit that the scenery was amazing, this hike is not for the faint of heart. Fodor’s Guide said it was moderate, but maybe the combination of rain over the few days prior with me starting to fall ill made it a death march. At any rate, be prepared for some steep climbs and narrow paths that lead to a rocky beach that isn’t anything what you picture to be a beach. I recommend this hike only if it’s dry and if you have hiked previously on moderate trails. Needless to say, I did not brave the trail on our return. On our third day of our first trip, I was a little worse for wear, but we did manage to catch some views of the Kilauea Lighthouse and humpback whales swimming offshore. We did not enter the grounds of the Refuge/Lighthouse, but we did catch a glimpse of many species of birds, as well as the whales (side note- the entrance fee is $5 per person and any proceeds at the gift shop go to the refuge, so it would be worth going into the park, as long as you aren’t contagious!) We did tour the lighthouse during our second trip and it was an interesting stop for those who enjoy wildlife and some gorgeous views. On our second trip, my stepdaughter really wanted to go to a luau. If you’ve read many of my other reviews, you’ll know that I’ve been to MANY of them. However, I kept an open mind and we booked an evening at the Smith’s Tropical Paradise. For $78-$88/person, you get all you can eat food, all you can drink, and an hour long dance show that was extremely well thought out and quite elaborate. I was shocked, to be honest, and the level of detail that went into this production. Even better was that the food was delicious! I’m glad I kept an open mind about, however, it’s a VERY touristy thing to do. I’d at least consider checking it out just for the experience. One thing we wished we had been able to do on both trips is take a boat tour or helicopter tour of the Na Pali Coast. My illness prevented it this first time and my stepdaughter’s motion sickness prevented it the second time. It was stunning on the hike, so I’m sure it’s even more stunning looking up at it from the ocean. So, it sounds like I need to make a third trip back to finally do what I’ve always wanted to do! We had an amazing time both times regardless of any mishaps that occurred along the way. After having been to a few different islands, this one is one of my favorites and it is my favorite island as far as natural beauty is concerned. I hope to be able to continue to return here in the future, armed with Vitamin C and hand sanitizer, of course!